Harrison Colby, A genealogy of the descendants of Abraham Colby and Elizabeth Blaisdell, his wife, who settled in Bow in 1768, , at https://archive.org/details/genealogyofdesce00colb . Concord, N.H.: Printed by the Republican Press Association, (1895) Microfilm #896944 of the Family History Library, Salt Lake City, Utah, p. 48. 1880 United States. Census Office. 10th census, 1880 federal population census, Washington, District of Columbia: National Archives and Records Service, ([19--]) , FHL Film 1254766 National Archives Film T9-0766 Page 250A. He was the son of Levi Colby and Caroline Lee. Massachusetts Vital Records, 1841-1910, , Vol: 209 ; Page: 254. Massachusetts Vital Records, 1841-1910, , Vol: 98 ; Page: 33. Massachusetts Vital Records, 1841-1910, , Vol: 368 ; Page: 273. Massachusetts Vital Records, 1841-1910, , Vol: 323 ; Page: 230. Massachusetts Vital Records, 1841-1910, , Vol: 224 ; Page: 275. Massachusetts Vital Records, 1841-1910, , Vol: 332 ; Page: 243. Vital records of Amesbury, Massachusetts to the end of the year 1849, , at https://archive.org/details/vitalrecordsofam00ames . Topsfield, Mass. : Topsfield Historical Society, (1913) , p. 61.
living at 1605 Hedges, Fresno, Fresno County, California. "California, Death Index, 1940-1997," index, FamilySearch (https://familysearch.org/pal:/MM9.1.1/VP2V-VMN : accessed 01 Dec 2012), Jennie Luella Joseph, 1945; citing California Department of Health Services, Vital Statistics Section, Sacramento, California. 1880 United States. Census Office. 10th census, 1880 federal population census, Washington, District of Columbia: National Archives and Records Service, ([19--]) , Census Place: Clifton, Pierce, Wisconsin; Roll: T9_1441; Family History Film: 1255441; Page: 148.2000; Enumeration District: 114. 1900 United States. Census Office. 12th census, 1900 population census schedules, Washington, District of Columbia: Bureau of the Census Micro-Film Laboratory, ([197-]) , Census Place: Prescott, Pierce, Wisconsin; Roll: 1811; Page: 10B; Enumeration District: 0112; FHL microfilm: 1241811. 1910 United States. Bureau of the Census. 13th census, 1910 population census schedules, Washington, District of Columbia: Bureau of Census Micro-Film Lab, ([19--?]) , Census Place: San Antonio, Los Angeles, California; Roll: T624_86; Page: 4A; Enumeration District: 0339; ; FHL microfilm: 1374099. "California, County Marriages, 1850-1952," index and images, FamilySearch (https://familysearch.org/pal:/MM9.1.1/XL4Z-TXK : accessed 02 Dec 2012), George Leonadis Winter and Jennie L Hardy, 1913. 1920 United States. Bureau of the Census. 14th census, 1920 population census schedules, Washington, District of Columbia: The National Archives, ([193-?]) , Census Place: Los Angeles Assembly District 71, Los Angeles, California; Roll: T625_111; Page: 19A; Enumeration District: 303; Image: 634. 1930 United States. Bureau of the Census. 15th census, United States, 1930 federal census : population schedules ; NARA microfilm publication T626, Washington, District of Columbia: Bureau of the Census Micro-Film Laboratory, ([19--?]) , Census Place: Fresno, Fresno, California; Roll: 117; Page: 14A; Enumeration District: 42; Image: 217.0; FHL microfilm: 2339852. Find A Grave Memorial# 18528900. He was the son of John Colby and Maria Davis. living at Bow, Merrimack County, New Hampshire. He was buried in Alexander Cemetery on River Road, Bow, Merrimack County, New Hampshire. Harrison Colby, A genealogy of the descendants of Abraham Colby and Elizabeth Blaisdell, his wife, who settled in Bow in 1768, , at https://archive.org/details/genealogyofdesce00colb . Concord, N.H.: Printed by the Republican Press Association, (1895) Microfilm #896944 of the Family History Library, Salt Lake City, Utah, p. 103. Harrison Colby, A genealogy of the descendants of Abraham Colby and Elizabeth Blaisdell, his wife, who settled in Bow in 1768, , at https://archive.org/details/genealogyofdesce00colb . Concord, N.H.: Printed by the Republican Press Association, (1895) Microfilm #896944 of the Family History Library, Salt Lake City, Utah, p. 102. COLBY FAMILY & OTHERS at http://freepages.genealogy.rootsweb.com/~colby/colbyfam, citing: FHL Number 1000976; COLBY, Jesse, Age: 74 years; Marriage: Martha ELLIOTT, Age: 70 years, Date: 15 Jun 1872; Recorded in: Birth and Marriage Index for New Hampshire. 1880 United States. Census Office. 10th census, 1880 federal population census, Washington, District of Columbia: National Archives and Records Service, ([19--]) , Census Place: New Boston, Hillsborough, New Hampshire; Roll: T9_764; Family History Film: 1254764; Page: 548.4000; Enumeration District: 152; Image: 0563. "New Hampshire Death Records, 1654-1947," database with images, FamilySearch (https://familysearch.org/ark:/61903/1:1:FSKL-4WB : 12 December 2014), Christie, 14 Jan 1842; citing New Boston, Bureau Vital Records and Health Statistics, Concord; FHL microfilm 1,001,070. "United States Census, 1860", database with images, FamilySearch (https://familysearch.org/ark:/61903/1:1:M7WP-L68 : 30 December 2015), John K Cristy, 1860. Harrison Colby, A genealogy of the descendants of Abraham Colby and Elizabeth Blaisdell, his wife, who settled in Bow in 1768, , at https://archive.org/details/genealogyofdesce00colb . Concord, N.H.: Printed by the Republican Press Association, (1895) Microfilm #896944 of the Family History Library, Salt Lake City, Utah, p. 131. 1880 United States. Census Office. 10th census, 1880 federal population census, Washington, District of Columbia: National Archives and Records Service, ([19--]) , FHL Film 1254542; National Archives Film T9-0542; Page 25B. COLBY FAMILY & OTHERS at http://freepages.genealogy.rootsweb.com/~colby/colbyfam, FHL Number 1000976; COLBY, Joel W. Age: 30 years, Marriage: Helen J. TARBOX Age: 33 years, Date: 16 Jul 1891; Recorded in: Birth and Marriage Index for New Hampshire. "New Hampshire, Birth Records, Early to 1900," index and images, FamilySearch (https://familysearch.org/pal:/MM9.1.1/FL2R-Y8Z : accessed 11 Dec 2012), John Colby, 05 Jul 1827. "New Hampshire, Marriage Records, 1637-1947," index and images, FamilySearch (https://familysearch.org/pal:/MM9.1.1/FLXF-TZR : accessed 12 Dec 2012), John Colby and Eliza A. Stewart and null, 1848. Harrison Colby, A genealogy of the descendants of Abraham Colby and Elizabeth Blaisdell, his wife, who settled in Bow in 1768, , at https://archive.org/details/genealogyofdesce00colb . Concord, N.H.: Printed by the Republican Press Association, (1895) Microfilm #896944 of the Family History Library, Salt Lake City, Utah, p. 120. 1850 United States. Census Office. 7th census, Population schedules of the seventh census of the United States, 1850, Washington, District of Columbia: National Archives. Central Plains Region, (1964) , refer to Manchester #809 / #921. Harrison Colby, A genealogy of the descendants of Abraham Colby and Elizabeth Blaisdell, his wife, who settled in Bow in 1768, , at https://archive.org/details/genealogyofdesce00colb . Concord, N.H.: Printed by the Republican Press Association, (1895) Microfilm #896944 of the Family History Library, Salt Lake City, Utah, p. 7. David W. Hoyt, The old families of Salisbury and Amesbury Massachusetts : with some related families of Newbury, Haverhill, Ipswich, and Hampton, and of York County, Maine / David W. Hoyt., , at https://archive.org/stream/cu31924025963772 . Providence, R. I.: Snow & Farnham, (1897) , p. 666. James Otis Lyford, History of the Town of Canterbury, New Hampshire, 1727-1912, Concord, N.H.: The Rumford Press, (1912) , p. 89. Harrison Colby, A genealogy of the descendants of Abraham Colby and Elizabeth Blaisdell, his wife, who settled in Bow in 1768, , at https://archive.org/details/genealogyofdesce00colb . Concord, N.H.: Printed by the Republican Press Association, (1895) Microfilm #896944 of the Family History Library, Salt Lake City, Utah, p. 8, 102. Harrison Colby, A genealogy of the descendants of Abraham Colby and Elizabeth Blaisdell, his wife, who settled in Bow in 1768, , at https://archive.org/details/genealogyofdesce00colb . Concord, N.H.: Printed by the Republican Press Association, (1895) Microfilm #896944 of the Family History Library, Salt Lake City, Utah, p. 7, 102. "New Hampshire Marriage Records, 1637-1947," database with images, FamilySearch (https://familysearch.org/ark:/61903/1:1:FLXF-T86 : 12 December 2014), John Colby and Mary A. Brown, 27 Jun 1842; citing , Bureau of Vital Records and Health Statistics, Concord; FHL microfilm 1,000,976. "United States Census, 1870," database with images, FamilySearch (https://familysearch.org/pal:/MM9.3.1/TH-266-11839-138390-48?cc=1438024 : accessed 18 April 2016), New Hampshire > Belknap > Gilford > image 83 of 86; citing NARA microfilm publication M593 (Washington, D.C.: National Archives and Records Administration, n.d.). 1880 United States. Census Office. 10th census, 1880 federal population census, Washington, District of Columbia: National Archives and Records Service, ([19--]) , FHL Film 1254760; National Archives Film T9-0760; Page 73B. "New Hampshire Death Records, 1654-1947," database with images, FamilySearch (https://familysearch.org/ark:/61903/1:1:FSJX-LBJ : 12 December 2014), John Colby, 21 Jun 1902; citing Gilford, , New Hampshire, Bureau Vital Records and Health Statistics, Concord; FHL microfilm 2,078,689. Harrison Colby, A genealogy of the descendants of Abraham Colby and Elizabeth Blaisdell, his wife, who settled in Bow in 1768, , at https://archive.org/details/genealogyofdesce00colb . Concord, N.H.: Printed by the Republican Press Association, (1895) Microfilm #896944 of the Family History Library, Salt Lake City, Utah, p. 108. William Richard Cutter, Historic Homes and Places and Genealogical and Personal Memoirs Relating to the Families of Middlesex County, Massachusetts, New York: Lewis Historical Publishing Company, (1908) , Vol. 1, p. 371. David W. Hoyt, The old families of Salisbury and Amesbury Massachusetts : with some related families of Newbury, Haverhill, Ipswich, and Hampton, and of York County, Maine / David W. Hoyt., , at https://archive.org/stream/cu31924025963772 . Providence, R. I.: Snow & Farnham, (1897) , p. 165. Vital records of Amesbury, Massachusetts to the end of the year 1849, , at https://archive.org/details/vitalrecordsofam00ames . Topsfield, Mass. : Topsfield Historical Society, (1913) , p. 534. Vital records of Amesbury, Massachusetts to the end of the year 1849, , at https://archive.org/details/vitalrecordsofam00ames . Topsfield, Mass. : Topsfield Historical Society, (1913) , p. 56. Vital records of Amesbury, Massachusetts to the end of the year 1849, , at https://archive.org/details/vitalrecordsofam00ames . Topsfield, Mass. : Topsfield Historical Society, (1913) , p. 58. Vital records of Amesbury, Massachusetts to the end of the year 1849, , at https://archive.org/details/vitalrecordsofam00ames . Topsfield, Mass. : Topsfield Historical Society, (1913) , p. 66. Vital records of Amesbury, Massachusetts to the end of the year 1849, , at https://archive.org/details/vitalrecordsofam00ames . Topsfield, Mass. : Topsfield Historical Society, (1913) , p. 63. Vital records of Amesbury, Massachusetts to the end of the year 1849, , at https://archive.org/details/vitalrecordsofam00ames . Topsfield, Mass. : Topsfield Historical Society, (1913) , p. 65. "New Hampshire Birth Records, Early to 1900," database with images, FamilySearch (https://familysearch.org/ark:/61903/1:1:FL2R-BWY : 12 December 2014), John Colby, 02 Jan 1786; citing Salisbury, Merrimack, New Hampshire, United States, Bureau of Vital Records and Health Statistics, Concord; FHL microfilm 1,000,378. "Massachusetts Marriages, 1695-1910," database, FamilySearch (https://familysearch.org/ark:/61903/1:1:FCHV-H2P : 4 December 2014), John Colby and Mary Hasseltine, 22 Jun 1808; citing reference ; FHL microfilm 14,767. John J.Dearborn, The History of Salisbury, New Hampshire, , at https://books.google.com/books?id=_9ThwN-QpVYC . Manchester, N. H.: William E. Moore, (1890) , p. 527. Massachusetts Vital Records, 1841-1910, , Vol: 22 ; Page: 110. M. V. B. Perley, "James Howe of Ipswich, and some of his descendants," The Essex Institute Historical Collections, Vol. LIV (1918): p. 175, no. 258. "New Hampshire Birth Records, Early to 1900," database with images, FamilySearch (https://familysearch.org/ark:/61903/1:1:FL2R-YY9 : 12 December 2014), John Ladd Colby, 16 May 1820; citing Dunbarton, Merrimack, New Hampshire, United States, Bureau of Vital Records and Health Statistics, Concord; FHL microfilm 1,000,378. 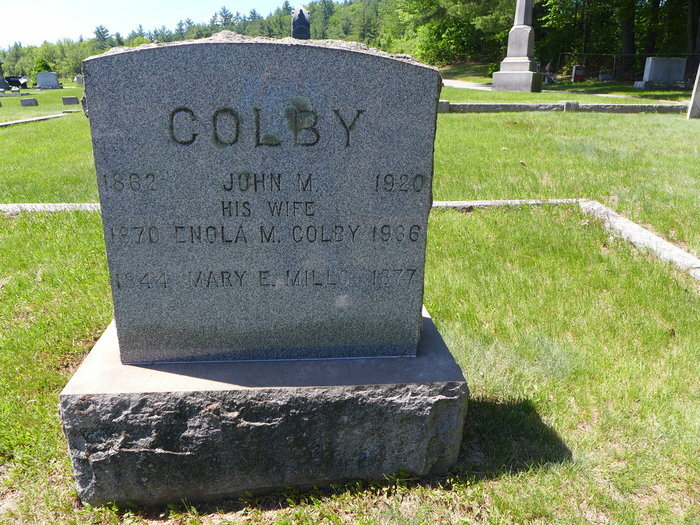 COLBY FAMILY & OTHERS, at http://freepages.genealogy.rootsweb.com/~colby/colbyfamciting Index to births, early to 1900 New Hampshire. Registrar of Vital Statistics. COLBY FAMILY & OTHERS at http://freepages.genealogy.rootsweb.com/~colby/colbyfam, /d154.html. COLBY FAMILY & OTHERS at http://freepages.genealogy.rootsweb.com/~colby/colbyfam, /d154.html citing The History of Hollis, Samuel Worcester, 1879:325. Harrison Colby, A genealogy of the descendants of Abraham Colby and Elizabeth Blaisdell, his wife, who settled in Bow in 1768, , at https://archive.org/details/genealogyofdesce00colb . Concord, N.H.: Printed by the Republican Press Association, (1895) Microfilm #896944 of the Family History Library, Salt Lake City, Utah, p. 110. 1880 United States. Census Office. 10th census, 1880 federal population census, Washington, District of Columbia: National Archives and Records Service, ([19--]) , FHL Film 1254765; National Archives Film T9-0765; Page 54A. "New Hampshire Marriage Records, 1637-1947," database with images, FamilySearch (https://familysearch.org/ark:/61903/1:1:FLXF-YXT : 12 December 2014), John M. Colby and Enola M. Colby, 06 Sep 1893; citing Tilton, Belkap County, New Hampshire, Bureau of Vital Records and Health Statistics, Concord; FHL microfilm 1,000,976. "New Hampshire Death Records, 1654-1947," database with images, FamilySearch (https://familysearch.org/ark:/61903/1:1:FSJX-G4G : 12 December 2014), John M. Colby, 18 Jun 1920; citing Canterbury, , New Hampshire, Bureau Vital Records and Health Statistics, Concord; FHL microfilm 2,078,689. Record added: Jan 06, 2008.